1. Nordstrom – hands down my favorite store – their return policy is unbelievable, their customer service is superb and they offer free shipping on all orders! 2. We get to shop Fall’s new arrivals at sale price. Yes- regularly full-priced items all at discounted prices! Nothing on sale is old, which is MY kind of sale! Prices go up immediately post sale. These are the trends you will be seeing come Fall. Think velvets, bell sleeves, metallics, flowy pieces, distressed jackets, cropped jeans, rich colors. The #nsale is open to Nordstrom cardholders only during the early-access period. Meaning, you must have a Nordstrom debit (no longer offering this option) or credit card to shop early access. It’s super easy to apply, be approved, and start shopping immediately. You can do that here. You’ll get a $20 bonus note when you spend $100 or more using your Nordstrom credit card the day you’re approved. So you can apply now, be approved, and start shopping the items below TODAY! If you decide the Nordstrom card isn’t for you, public sale access will begin Friday, July 21. I will be posting another huge round-up that day with everything left in stock, what I’ve bought so far, etc. so be sure to check back! As a reminder- #nsale items sell out FAST! Last year, I remember kicking myself wishing I had ordered a few things as soon as they released as they sold out and weren’t restocked. Sometimes items are re-stocked and if that happens, I will try my best to keep you updated! But moral of the story here is its better to be safe than sorry! The good stuff goes quickly! This sweater is only $24 and comes in 6 different colors! This one ($35) comes in grey, burgundy, and black and is long enough to wear with leggings! If you’re looking for the perfect Fall-ish sweater… love this one! This is the same black (faux) leather coat as last year except this years edition has gold details- LOVE! How cute is this long sleeve, open back top?! This tie front blouse is adorable! Think I’m going to pick it up in white! And LOVE this oversized plaid tunic! It would be super cute paired with a baseball cap and sneakers. These black distressed jeans are only $38! These are the ones I wore in my stories and come in white too. Also only $38 on sale! These are a little bit of a splurge but if you want to invest into some good jeans- these are the ones you want! This cute & easy breezy ruffle sleeve tee dress is only $30! Comes in 3 different colors! If you’re looking for a good workout tank- I love this brand! This one is simple yet I love how low the arm holes are. It will show off a little bit of your sports bra! I’m personally not a fan of long sleeve work out tops (I get too hot!) – but if you are, love this one! These high waisted leggings are only $35! I’ve never worn this brand but I know a ton of girls who do and love it! I have a feeling this cardigan (above) is going to sell out fast! Wearing a size 2 for reference. And these jeans are only $38! Size down 1 size. This picture does not do this billowy blouse justice! I love it! Can be tucked in or out. Wearing a Small. Same jeans as pic above! 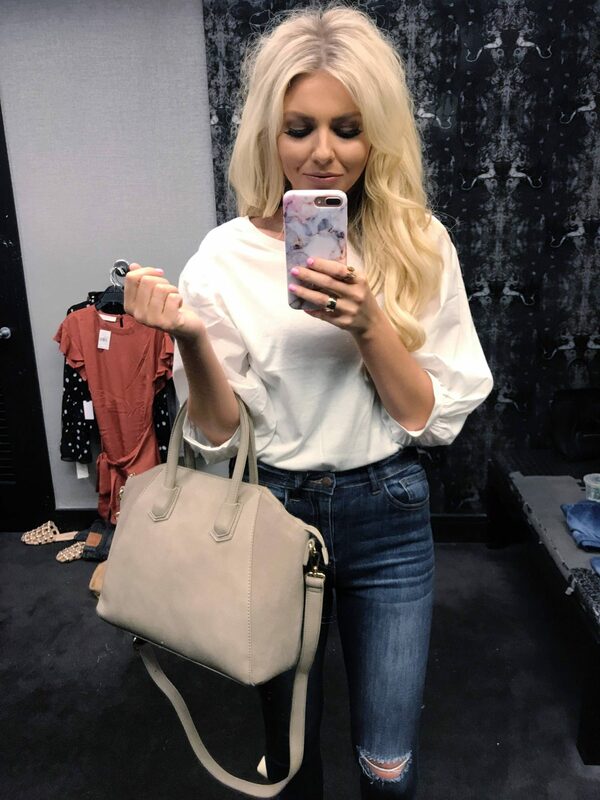 This PURSE is one of my favorite items from the sale! The color goes with everything & it looks way more expensive in real life. It’s a mix of suede and (faux) leather and is only $52 on sale – a steal! I promise you’ll get so much use out of it year round. This taupe/grey color can easily be worn every season! This jacket! I can’t tell if it’s going to be a hit or flop but it will be one or the other 😉 For me- it was a big time hit! 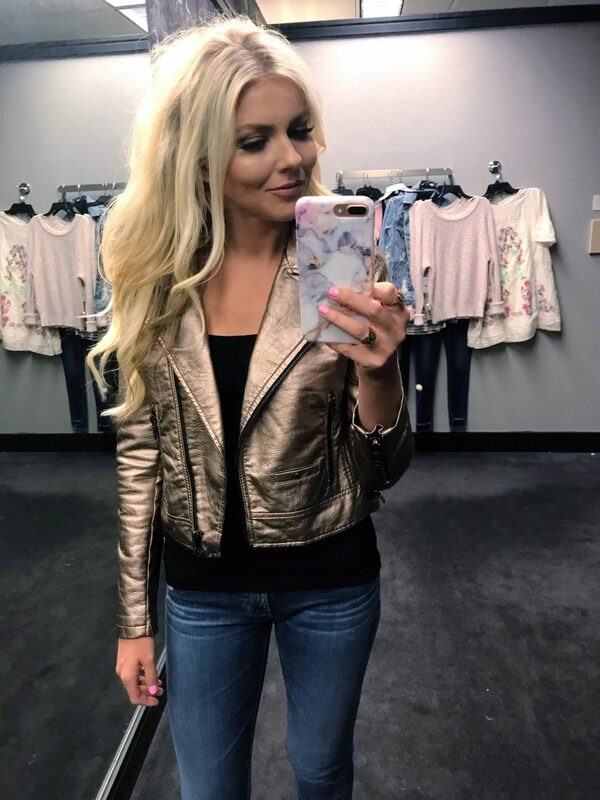 You will be seeing metallics everywhere this Fall/Winter so this (faux) leather jacket caught my eye as soon as I saw it! Wearing a size Small. These AG jeans are on sale and I LOVE them! I don’t know why I’ve never owned a pair. I’ve heard so many good things so I finally gave it a go! They fit like a glove and are extremely flattering! Size down. Wearing a Size 26. This blouse!!! LOVE IT! Wearing a size Small. Where are my stripe lovers at?! When it doubt, choose stripes! Can’t go wrong. Love this classic striped long sleeve top for only $18! It also comes in five other colors! Wearing a Small. This tee (a slightly different version) was one of the top sellers from last year’s sale! Probably because these simple tees fit well (size down 1 size), come in 4 different colors, and are only $15 each! I am OBSESSED with this dress! The second I saw it, I knew I was going to love it! Seriously so cute! Wearing a size Small.